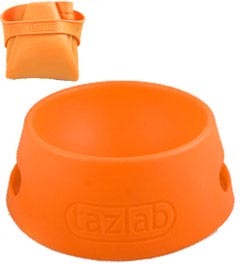 These Aqua-Fur foldable bowls from Tazlab look really neat. Unlike the other collapsible bowls I’ve seen, this one is dishwasher safe. It looks more stable too. I like the fun colors! Don’t want to spend that much? You can get cheap, foldable bowls at Petco. Or you can make your own nifty collapsible bowl from oilcloth.